While the XC season was finishing up, the indoor track and field was just getting started at Ursinus College on Saturday. As has been the case the past few seasons, the meet was home to some terrific season-opening performances. Some familiar names had strong season debuts, while a few newcomers made their presence known to the state in Week 1 of the indoor campaign. How about an all-conditions PR to open up the season? 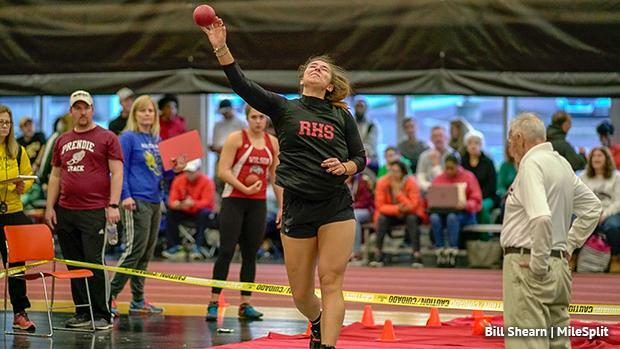 That's what Keeley Suzenski of Reading put down on Saturday afternoon in the shot put. Suzenski, who had a breakthrough season last year, showed she's the one to beat in PA in the event (and a national contender as well). Suzenski threw 47-06.75, a PR by a foot and a half and an early-season US#1 by 6.5 feet! It's a big start to the indoor season for the senior, who was second at indoor states last year. For some context, Payden Montana, who set the outdoor state record last year, started her season with a pair of 45-foot throws last year. Germantown Academy's Meaghan Toscano threw well, too. She tossed a throw of 40-06.5 to take second. That's an indoor PR for Toscano. It was a big day for the Hebron siblings -- one a veteran and the other a freshman standout. The senior, Savion Hebron of Neshaminy, won three events on the day, capturing the 55 meters, 400 meters, and then the 200 meters during a long day at Ursinus. Hebron went 6.50 to win the 55, then went 49.26 to win the 400. He closed out his day with a win in the 200 meters, running 22.18. All three are PA#1s. The Lower Merion duo of Devon Tate and Davon Tate went 2-3 in the 55 with Devon running 6.52 and Devon clocking a 6.59. The freshman, Sanaa Hebron of George School, had a big high school debut. Hebron was third in the 55 (7.40), but then won a pair of events later in the day. She went 56.80 to run away with the 400 meter win and then finished off with a 25.21 to take the 200 meters. The pair will be worth watching for in the sprints as the season progresses. How's this for debuts? Moforehan "Fore" Abinusawa of Germantown Academy dropped a 6.95 in the 55 meters to take the win in a strong field. It was the high school debut for the freshman, who came in with an already-terrific resume from the AAU ranks. If Abinusawa's US#1 clocking wasn't impressive enough, the time came without blocks. This isn't the last we've seen from the promising ninth grader. She wasn't the only GA athlete picking up wins on Saturday. Liliana Cohen, a Cardozo (NY) transfer, had a strong season opener in the pole vault. Cohen jumped 12-00 for the win, a PA#1 and a sign that she'll compete for the top spot in PA this season. Olatide Abinusawa won the shot put with a solid toss of 51-02.75, over 3 feet better than his opening throw from this meet last season. Saint Basil Academy's Tia Taylor had a strong opening meet. The sophomore went 8.48 to win the 55-meter hurdles and then added a second place finish in the long jump (17-07.75). Her teammate Alina LaForest won the mile in 5:22.64. Neumann Goretti showed off its depth on Saturday. The squad started off the day with a 10:00.02 to win the 4x800-meter relay, the nation's second fastest time on the young season. It ended the day with a 4:06.39 to win the 4x400-meter relay. Mykala Perry, the state's top 400m returner, moved up the 800 meters on Saturday and captured the win in 2:21. In the mile, Cole Walker of Unionville won in 4:28.83, outkicking Christian McComb of Boyertown, who ran 4:29.56, a pair of solid early indoor times. Wyomissing Area's Ben Kuhn took second in the 3,000 meters, running a strong 9:02.29.